Jealousy in relationships, what are the roots of this detrimental emotion? Jealousy is, in fact, a whole set of negative emotions ranging from guilt to anger. But generally there is one underlying emotion that gives rise to the rest of the negative emotions - fear. Jealousy is a fear, such as a fear of losing your partner, fear of losing your established lifestyle or fear of losing your self-confidence. Jealousy, therefore, is a fear of a loss. Jealousy in relationships is totally natural, especially if you love your partner and want to be together. 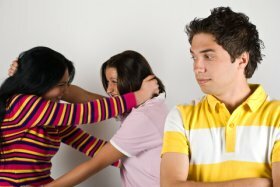 Jealousy is common not only for monogamous relationships, but also for open relationships, where both partners are allowed to engage in sexual relations with other people. Is There Something Wrong With Being Jealous, or No? If you notice that jealousy damages your life or the life of your partner, it's time to get to the bottom of it. The best way to deal with jealousy is to find its roots. Try to find the roots of jealousy by breaking it down into smaller parts, such as fear, anger, insecurity, guilt, and so on. Can it be that you are yearning for some reassurance? Maybe you're unhappy with your current physical shape and all you need is to get into shape? Can it be that you feel lonely or neglected by your partner? Is your partner obsessed with his/her work? Or is there something else that you feel is going on? If you manage to find the underlying reason behind jealousy, you will most likely be able to take care of it, minimizing or completely eliminating it.